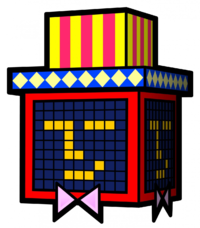 The InterNed is a digital block with a bow tie, a hat, and a face made with pixels that appeared in Super Paper Mario. His name is a portmanteau of "internet" and the name "Ned". He was created by the inventor The InterChet. The InterNed appears in Merlee's Mansion as a quiz host who helps Mario and Peach find out which Merlee is genuine after Mimi makes herself look identical to the mysterious charmer in the 66th Annual "That's My Merlee!" Show. The InterNed also appears in the The Underwhere bar in Flipside after the game is beaten. The InterNed can here be used as a sound test. For ten Coins, The InterNed will play a song from the game on the jukebox in the bar, though the song picked is entirely random. However, the song can only have the possibility of being picked if it is already heard. For example, if the player didn't go to the Overthere Shrine after defeating Bonechill, the InterNed cannot play Overthere Shrine on the jukebox. His Catch Card is found on Flipside B1 by flipping near the top of the water. Card Description: The InterNed knows all... and also moonlights as a game-show host! French Jean-Pierre Reference to the famous French quiz host Jean-Pierre Foucault. German InterFred Portmanteau of internet and the name Fred. Italian Internello Portmanteau of internet and the name Nello. This page was last edited on February 20, 2018, at 13:13.